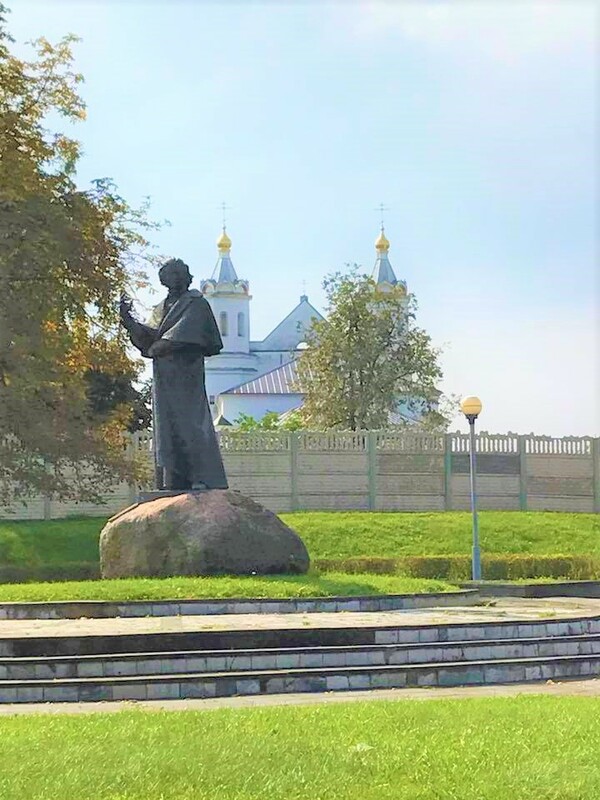 Living and traveling in Belarus means a history lesson a day, history lessons that show me how much my western eyes have missed about this space between western Europe and Asia. Here are the Baltic peoples, the Slavic peoples, and the (actual) Caucasian peoples. Mixed into this region – or perhaps extending to their “home regions” – are eastern Scandinavians/Vikings to the North and Turks to the south. Historically, Belarus is populated primarily by the Slavs. On Saturday I had the pleasure of visiting Novogrudok, one of the oldest towns in Belarus. 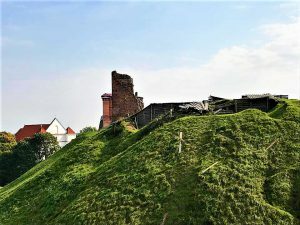 This town of 49,000 people was once a capital city – the first capital of the Grand Duchy of Lithuania before the capital was moved to Vilna (now Vilnius) in present-day Lithuania. This town may be a millennium old since it is mentioned as an already-existing town in historical chronicles of the year 1044. As we rode the bus up the jutting hills of Novogrudok, Sidney Karesh, my friend from California who is also here on a Fulbright exclaimed, “This is like a city hill in San Francisco!” Because these are the first hills we’ve encountered in Belarus, they are more striking than a hill would be at home. But I’ve made Indiana my home for long enough now that tree-populated flatlands outside the city are not an unusual sight. We even saw round bales wrapped in white plastic just as we might in any rural area of the United States. My dad used to make these. And Beth got some of her city school kids to believe that these white-wrapped bales are actually large marshmallows grown from the little marshmallow “seeds” we buy at the store! And they say I’m the devious one in our family! Besides being the oldest town I have ever visited (so far), Novogrudok is the one of highest points in Belarus, one of the only places with hills that provide an “overlook” of the surrounding countryside. The following U.S. states have a lower high point than Belarus: Delaware, Florida, Louisiana, Mississippi, and Rhode Island. The other 45 states have high points that are higher in elevation. Shockingly, this includes even my home state of Indiana, with a high point that is a little bump in the woods at 1,257 feet (383 meters). But the high point in Novogrudok at Castle Hill (323 m / 1060 ft) is much more impressive than a bump in the woods. It’s a big bump above the woods, with the ruins of a castle perched on top. 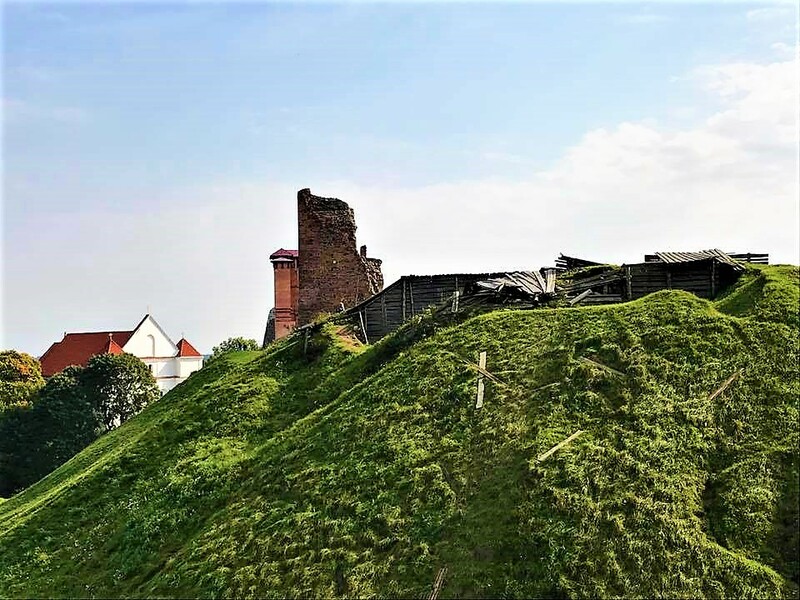 The two towers that make up the still-standing ruins of Mindaugas Castle are situated on a hill that they say is sliding down toward the modern park and small lake down below. One tower has been restored, but how far restoration will go in light of the hill’s current slippage, I don’t know. From the top of that hill, you can see all around the whole town and the countryside. Mindaugas was crowned King of Lithuania in 1253, and the stone castle was begun the following century. Before that, the buildings (including an earlier castle) were all wooden. In the shadow of the castle is the Farney Catholic Church of the Transfiguration. This is the church were the Lithuanian and Polish kingdoms were merged – where King Vladislaw Jagiello and Princess Sophia of the Grand Duchy of Lithuania were married in 1422. This church is also famous for its “protest” of the Nazi incursions during World War II. A contingent of nuns in this church hatched a plan to protect Belarusians and Poles from the Nazis during the Great Patriotic War (resistance against Nazi incursions during WWII). When their plan came to light, all but one of the nuns were killed. 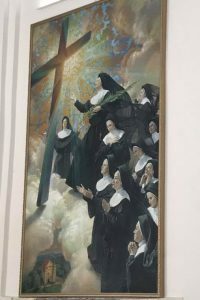 They are now in the process of beatification and sometimes referred to as “Blessed Stella and Companions.” This is also the church where revolutionary and poet Adam Mickowicz was baptized in 1799. And it is Mickowicz who brought me to this town. Following Mickowicz’s life gives some sense of the changing social and political dynamics of Europe and Russia during the nineteenth century. Remembered today as a Polish revolutionary and poet (but I repeat myself! ), Mickowicz was born in Novogrudok, Belarus, in 1798, just after the partitions of Poland brought an end to the Polish-Lithuanian Commonwealth and Belarus was swallowed up by the Russian Empire. Adam’s Polish Catholic family sent him to school at the Dominican School from 1807-1815, at which time he relocated to Vilnius (in present-day Lithuania) and obtained a degree in education from the (Russian) Imperial University of Vilnius. He taught school in Kaunus, Lithuania, from 1819 to 1823. In 1823, he published Grazyna, a poem about a legendary (and probably actual) woman warrior who served as a Lithuanian chief against invading Teutonic Knights. Apparently, Amazon warriors rose up in this area too! Yay for all the wild women among us! Mickowicz was exiled as a result of his involvement in pro-Poland groups in Vilnius and sent to Russia in 1824. He lived in St. Petersburg and Moscow most of the next five years, with an excursion to Crimea that led to the publication of his Crimean Sonnets in 1826, weaving a romantic tale of a poet in exile in an oriental land. In 1828, he wrote a subversive narrative poem called Konrad Wallenrod, but its historical setting and in-fighting among the government censors allowed him to escape further retribution from the empire. He was allowed to leave the Empire in 1829, in part because of the advocacy of his friends among the Russian literati (including Alexander Pushkin). Upon leaving the Empire, Mickowicz traveled, lived, and sometimes gave lectures at universities in France, Switzerland, Germany, Italy, Prussia, and (German) Poland. In all of these places, he was involved in the work of the revolutionaries, meeting other supporters of nineteenth-century revolutions, such as Margaret Fuller from the United States. Mickowicz became friends with the famous Polish composer Chopin, who would later set some of Mickowicz’s work to music. He enthusiastically supported the Crimean War as a way of promoting Polish independence by weakening the old European and Russian powers that had vied for dominance in the region, going so far as to relocate and fight with the Ottoman Empire (Turkey) against Russia in the year 1855. Unfortunately he died that same year – probably as a result of catching cholera. A few of Mickowicz’s other works are worthy of special mention. Dziady (Forefathers’ Eve) was written and published between 1823 and 1832, from the time of his arrest by imperial authorities to the time of his settling in Paris. Dzaidy is also the name of the feast to celebrate the memory of the Slavic forefathers. He also published his most famous work, the famous poem Pan Tadeuz, while living in Paris in 1834. Now considered the Polish national epic, this poem is still required reading in Polish schools. He has also been called “the Slavic Bard.” As a revolutionary who celebrated the pre-Russian identity of the Slavs and Poles, Mickowicz is considered a national hero in Belarus and Lithuania as well as Poland. Old Joke: “In Novogrudok, you can get from Heaven to Hell in one night!” (or vice versa). 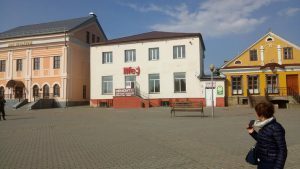 The nicknames for two bars in Novogrudok were Heaven and Hell. They are the building to the left and the one on the right. The yellowish one on the right was a Jewish home (before it was a bar), and it has been restored to look as it did at that time. When the Nazis came, they killed all but 550 of the more than 10,000 Jews who lived there at the time. Those last 550 were sent off to concentration camps. 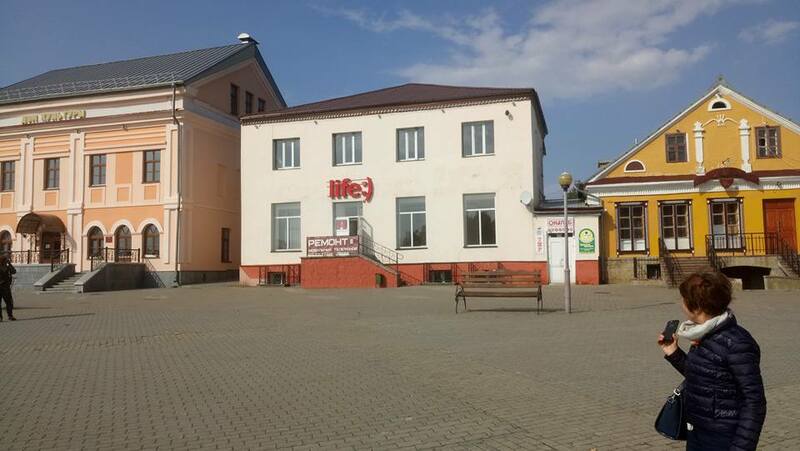 “Life :)” is a cell phone company in Belarus that uses the Latin alphabet and English language to market their wares. The tour guide at Mickowicz’s childhood home in Novogrudok related stories of Mickowicz’s love-hate relationship with his childhood home, a childhood accident when his mother was afraid he had died and took him to the Catholic cathedral where he revived, his estrangement from his father but not his mother, his changing friendship with Pushkin who supported the Russian Tsar, his romantic relationships and potential wives, and much more. The tour guide was dressed in a three-suit tie and spoke like a learned person rather than the breathless tones of an outdoor adventurer that so often characterizes American tour guides. I planned to write an entry on “Traveling and Teaching in Belarus,” but this is already a long entry. So I will write a separate blog post on Teaching in Belarus. This literary excursion took place at the conclusion of a conference on Teaching Literatures in English, hosted at Minsk State Linguistic University by Dr. Yuri Stulov, the president of the Belarusian Association of American Studies. I had the pleasure of meeting Dr. Philip McGowan of Queens University in Belfast at the conference at the university, during our outing to Novogrudok, and for dinner and some “al-co-hoool” (Ethan’s annunciation) with my family at a Belarusian restaurant called Свои (pronounced “svoi,” which means “their own”). McGowan is the president of the European Association of American Studies, and his Irish twang provided a pleasant lilt to my last week’s experiences of Belarus past and present.